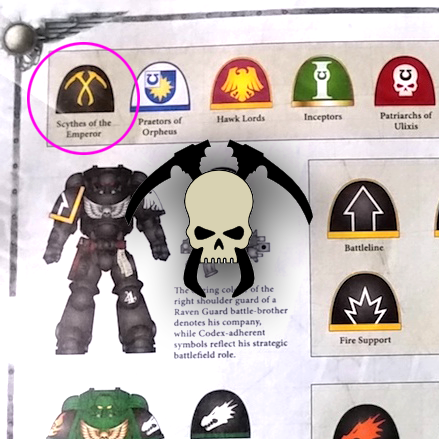 Well here is a big surprise for the Scythes of the Emperor! Turns out the Chapter is featured alongside several other obscure Chapters in the new 8th Edtion rulebook! Curiously, it appears Games Workshop is using the Death Spectre scythe artwork for us Sothans, slightly different to Black Library’s own art for the Scythes short stories and novel. From obscurity over 20 years, to a collection of the Scythes of the Emperor short stories, a novel, audio play and now a featured Chapter in the new Rulebook! Top result for my 20th year collecting The Scythes of the Emperor! Heh, I understand… Likewise my Griffons will remain in the Badab War era. I’m currently reading the book and it is certainly worth the purchase. It feels like there is more thought put into presentation (the whole box has that, by the way), and I like the little stylistical nods to Rogue Trader here and there. I haven’t reached the rules section yet, so I can’t comment on those at this point. But so far, so good. Really? Top stuff. Congrats man :) Definitely respect your opinion in review. I love the box design, speaks to my DTP and FMCG packaging days. Any mention of my Brothers, shout! I am currently working at making my primaris marines Scythes of the Emperor. Any idea how closely they follow the ultramarine squad/leadership markings? 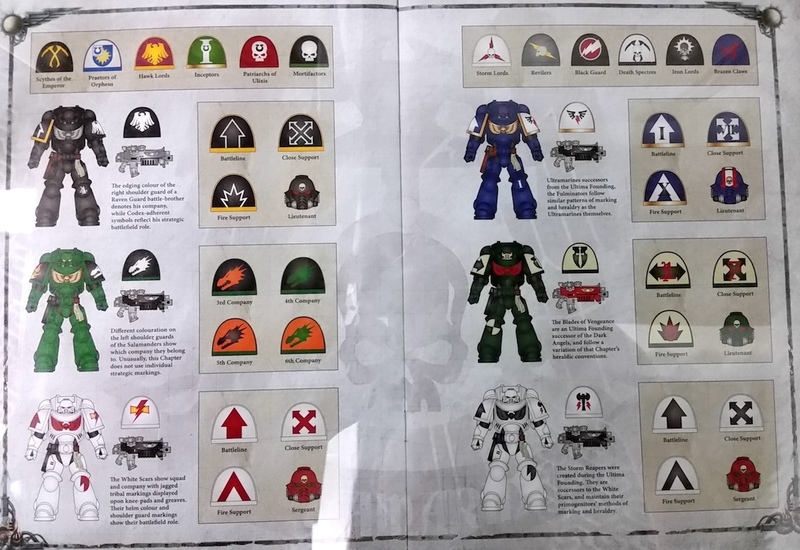 There is mention of yellow knee pad with a black skull to denote veteran status on Lexicanum … The rest is pretty ultramarine but visually doesn’t sound all that appealing. Maybe I should look to Imperial Fists for inspiration to denote important folks. Red helms for sergeants could work but I’m not sure white would, maybe a more bone like off white? Great to hear of some Scythes reinforcements! The Scythes are highly likely to follow Ultramarine markings – they operate in Eastern Ultramar, fourth tetra under an Ultramarine Tetrarch, Decimus Felix (Latest 2017 background lore). Protecting the Sotharan League and Shield Worlds. The knee+skull was in one of LJ Goulding’s books, being our patron in GW, I’d say thats canon. Red helms would work well, such as Brother Sargeant Maximillian [LINK]. I do like the idea of a Bone white, it will harmonise very well with Yellow. That would be my choice too.